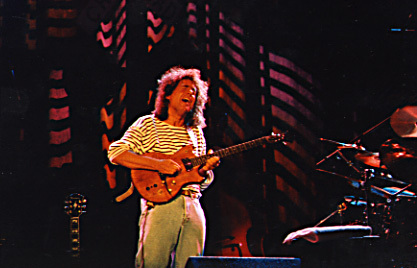 Pat Metheny playing his whammy-bar-equipped Roland G-303 guitar. 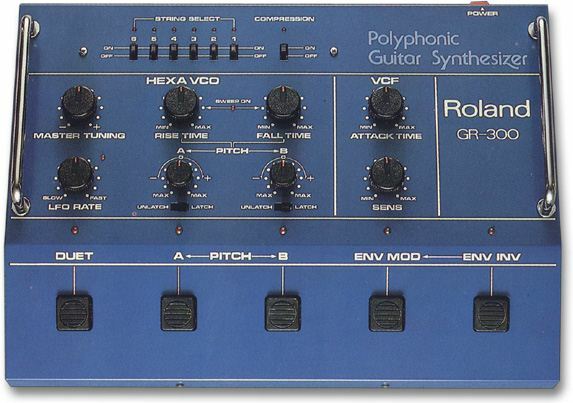 This rather primitive, completely analog guitar synthesizer came out around 1980 and is still being used by many guitarists, the most famous of which is Pat Metheny. I bought my GR-300 in 1994 and was amazed by the fact that it tracks faster than any modern guitar synth I've ever played. I became very curious about how its tracking works and why it feels so superior to modern digital guitar synths. In the years since then I've gone through several periods of studying the G R-300 and coming up with ways to increase its extremely limited sound palette.